The real question is why not Burma? When looking into the world consequences of the Egyptian demonstrations, analysts consider different countries as next possibilities? According to the Irrawaddady, �The ongoing protests that are forcing the beginning of a political transition in Egypt are receiving attention not only in the Arab region and among its strategic western allies like the US, the uprising is also being closely watched by authoritarian regimes such as Burma's and their pro-democracy opponents.� What can Burma learn from Egypts uprising? They media analyze labor conditions, human rights violations, oppression, lack of freedom of speech and rising unemployment. A few names have been thrown into the discussion, some more surprising than others, others not that surprising. The real question is why not Burma? Burmese government was recently scrutinized on Human Rights in the Periodic Review of the United Nations with little and no success. When questioned about the more than 2,100 political prisoners, Burmese spokesmen in United Nations said, they had no political prisoners, only people who had broken the law. That is Burmese military regime government laws. The Burmese Government refused to recognize any of the findings of the report. In Reviewing Burma' Review Irrawadaddy states, "The detention and torture of political prisoners, the persecution of ethnic and religious minorities, and the sexual violence in ethnic areas are but a handful of human rights abuses that the people of Burma face on a daily basis." So lets make a run down and check as all analysts around the world do with countries that are potentially next in the world consequences of Egypt. Human Rights violations, no democracy, check, nightmare labor conditions check, internet restriction, big check there, lack freedom of speech, check, corruption yes, a big check there and that is just to get started. So, why is Burma not analyzed and compared to Egypt. Why did the Periodic review of United Nations get no where? And how has Burma become invisible to eyes of the international community? For Burma the Egypt lay out played out in a very familiar way. According to the Wall Street Journal, "In 2007, security forces in Myanmar cracked down on communications following monk-led protests against the regime there, disabling some mobile phones and closing some service providers, but images of the clampdown continued to be relayed out of the country via cellphones. 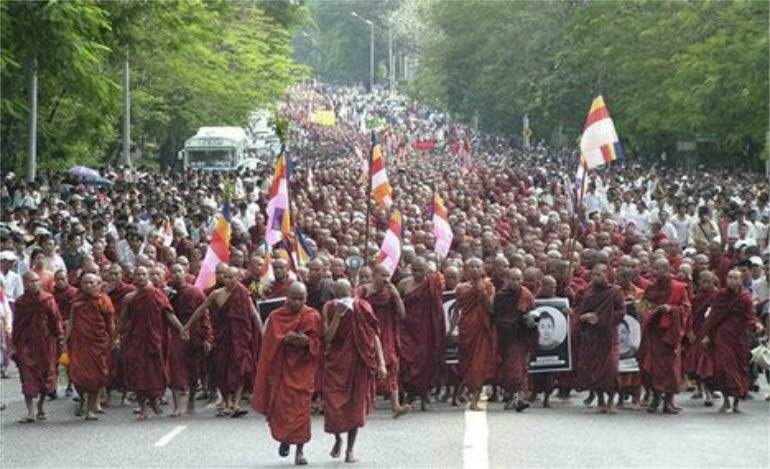 More than 110,000 people joined the Support the Monk's Protest in Burma group on Facebook." That sounds familiar. But 2007 is not 2010 and although Burma may not have a the Suez Canal, (big uncheck there), still things make no sense. Aung San Suu Kyi was released and some say that Burma is on a slow walk to democracy. The question today is not who is next? But what countries are censorced and why?It does make one wonder, what other countries go ignored and how many people around the world live in internet censorship to get a glimpse or two of the �People�s Power Revolution�.